In 2010, his senior year at Grandview High School in Aurora, Colorado, Gausman committed to LSU after going 9-2 with a 3.12 ERA. The 6-foot-4 Gausman also played basketball in high school, and he decided against giving it up to focus on baseball during his senior year, because he knew he’d miss hoops when he was finished with it. That’s an indication that he just wasn’t yet ready to dive into pro baseball. In June 2010, Kevin passed up the Dodgers offers after being the team's 6th round pick, preferring the baseball scholarship to LSU, where he majored in sports administration-leadership. Growing up, Gausman did not dream of being LSU’s ace, but he did dream of pitching in the College World Series. The story goes that Gausman’s great grandfather installed the lights at Rosenblatt Stadium in the days before the CWS was a multimillion-dollar extravaganza. His fee was modest, but he did ask for eight tickets to the College World Series—front row above the third-base dugout—in perpetuity. So Kevin, whose family is from Nebraska, grew up going to CWS games. His father always told him if he worked hard enough, he could play on that field someday. Gausman received plenty of exposure to LSU during his trips to the CWS, but originally he wanted to go to school in the West, at Arizona State or Oregon or in California. But he accepted former LSU recruiting coordinator David Grewe’s invitation to visit Baton Rouge, just to see what the South is like. When Gausman arrived in Baton Rouge, he said it took some time for him to decipher some of the Cajun accents and for him to get the lay of the land in a place that was very foreign to him. (He admits he thought a lake on campus was connected to the Gulf of Mexico.) But he quickly felt at home, with help from some of LSU’s passionate fans—like the woman the pitchers call the “K Lady,” who gets the fans going when an LSU pitcher has two strikes on a hitter. “When I first got here—she obviously takes a liking to the pitchers—she came up to me and said, ‘So, I hear you strike out a lot of guys. You’re going to hear a lot from me,’” Gausman said. He heard from her plenty as a freshman, when he struck out 86 batters in 89 innings, but that season was very much a learning experience. A big part of his maturation process was learning to control his emotions and handle pressure situations. Gausman says he is an intense competitor and half-jokes that he thinks he set the record for most technical fouls in a season during his basketball days. In 2012, Gausman was 11-1, 2.72 ERA with 128 strikeouts in 116 innings with LSU—one year after going 5-6, 3.51 and 86 strikeouts in 90 innings in 2011. In both 2013 and 2014, Baseball America had Gausman as the Orioles' second best prospect in their organization, behind only fellow-pitcher Dylan Bundy. Kevin has a gregarious personality, is a very good teammate and confesses to being a prankster. Gausman recieved the nickname "Dunkin" for his habit of eating three miniature powdered donut holes after every inning. This habit which started at LSU is a superstition that the local Baton Rouge media and fans picked up and ran with. Kevin's father, Clair Gausman, is a retired teacher and Pac-10 football referee. And his mother Winifred "Jo" Gausman is a nurse. MiLB.com: Take us back to the early days. When did you first start playing baseball? Kevin Gausman: I first started playing baseball, honestly, because my brother did. My dad didn’t really play baseball growing up. He grew up in a small town in Nebraska and he was more focused on football, but my brother was my hero growing up and I always wanted to do whatever he did. We started playing, and from Day One I just knew that I fit with it and I always liked it and always felt more comfortable on a baseball field than anywhere else. MiLB.com: Brian is seven years older than you. Did that age difference play a big role in your development? Gausman: That is something that definitely helped me. I saw how big he was, and looking back I remember watching him in high school and thinking, ‘Wow, he throws so hard — he’s so good.’ It’s pretty cool to look back and think about the person I looked up to so much and him being one of the key reasons why I am where I am right now. MiLB.com: Do you have any specific memories of playing ball with him? MiLB.com: On draft day, when did you first hear from the Orioles? Gausman: Not until after they picked me. I was as clueless as everyone else. I was just sitting back in my chair, and then the next thing I heard I was the first pitcher taken, No. 4 overall, by the Orioles. I thought I had a good chance to go in the top 10, but you never really know. When I was in high school, I thought I was going to be a late-first-round pick, and I ended up going in the sixth round. I think my experience with the Draft helped me the second time around. MiLB.com: The Orioles gave you a $4.3 million bonus. How exciting was that? Gausman: I love the fact that they have faith in me and know that I won’t let them down on purpose. Having that relationship with [LSU pitching coach] Alan Dunn, who came from the Orioles organization, the Orioles got to know a lot about my background and family. MiLB.com: What motivates you to succeed? Gausman: I would say probably just my love for baseball and the love for my state of Colorado. I want to put the state on the map. Being from Colorado, you don’t get the chance or the time to master your skill like kids from Arizona or Texas or Florida or California or any of the states that play baseball all year round. Eventually, I want to open up an academy for kids out here in Colorado to really help them, so they have a place where they can go all year round to throw a bullpen or stay in shape. MiLB.com: You’re famous for your superstitions in the clubhouse and the dugout, including eating powdered doughnuts between every inning on days when you pitch. Where did these superstitions come from? Gausman: The doughnuts started about eighth grade and has been going strong every since. I’ve always hopped over the line between every inning and after every inning. I’ve been doing that as far back as I can remember. My Dad always told me that it was bad luck to step up on the chalk because you don’t want to mess up how the field looks. There’s a bunch of other stuff, too. I put my socks on a certain way and I’m the type of person that if something’s working I’m going to keep doing it. If something goes wrong, I might think about changing it, but things are going pretty well and I’m going to keep doing it. Gausman likes his new look in 2014. After he debuted a new pair of prescription glasses and mowed down a Boston Red Sox lineup during spring training at JetBlue Park, the righthander joked that wearing his new specs can give him a little bit of an alter ego. “It’s just one less thing you’ve got to worry about,” Showalter said. “They have a pretty detailed eye test in the spring, and they said: 'You know, we can correct this if you want to.'" Gausman's astigmatism means he has to wear contact lenses for his farsightedness, but he's never been comfortable wearing them while pitching. Gausman received a pair of prescription glasses to try out. He tested them during workouts, and pitched with them for the first time. September 8, 2015: The trash talk had begun the night before at dinner. Yankees first baseman Greg Bird and Gausman, teammates at Grandview High School in Aurora, Colo., were set to face each other for the first time in the Majors at Yankee Stadium. Bird, 22, was still a catcher in those days. And he caught Gausman, 24, before Gausman committed to LSU after going 9-2 with a 3.12 ERA during his senior year of high school in 2010. "He was better today," Bird said. Then Bird went on to have his own stellar season, hitting .591 with 12 homers and 37 RBIs in just 18 games in 2011 before the Yankees selected him in the fifth round of the 2011 draft. November 25, 2015: For an entire generation of kids, especially those with glasses, Chris Sabo was a hero and a fashion icon. His trademark rec specs were proof that, yeah, you could be vision impaired and still be totally rad. And while the look of modern goggles have changed to more closely resemble something closer to TACTICAL VISION WEAR rather than Jerry Lewis' glasses in "The Nutty Professor," they still offered a glimpse of a player who was willing to stand out from his teammates and show off his lack of 20/20 vision. May 5, 2016: Major League Baseball's initiative for Mother's Day hits home for Gausman, whose maternal grandmother passed away from breast cancer before the right-hander was born. Gausman, for the second time in two years, helped select the winner of the Orioles' Honorary Bat Girl contest, Crystal Silins, who will be recognized in a pregame ceremony. Silins, a breast cancer survivor, threw out the ceremonial first pitch and will receive pink MLB merchandise. 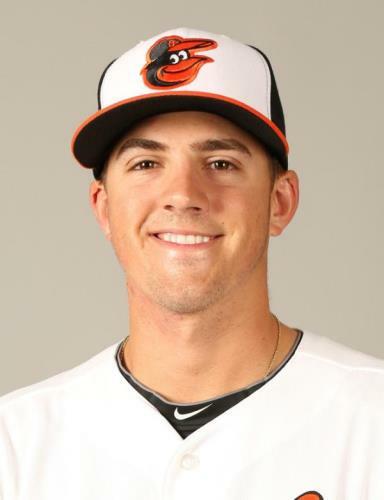 "One of the biggest things that was tough for me was you are given three finalists and they are told they are finalists and only one wins," said Gausman, who will give up his allotment of game tickets for Baltimore's May 14 game against Detroit to the other two finalists. "I think that's awesome. Who is to say their story isn't special enough to get them Honorary Bat Girl? "Gausman is more than happy to help raise awareness of breast cancer and support those who have been affected by the disease. He never met his grandmother, Minedale Augusta Carlson, but when the right-hander called home last year to tell his mother about his involvement with MLB's Mother's Day initiative, she couldn't hold back her emotions. "I remember calling my mom and her crying about it," Gausman said. "It's something she has to get routinely checked because it is in our family. And she was really happy that this is something I'm part of. This year, I'm actually here [in the Majors] more so I'm looking forward to doing more. "It's something my mom is proud I'm a part of," Gausman said. "There's no other disease that's been in my family that I can contribute to. When I picked [Crystal], I think the fact that she was newly married and wanted to have children. If you know anything about chemo, it doesn't really give you a chance to have kids. So she and her husband went out and adopted. Going through chemo and all those things and having the strength to go and adopt? That's got to be something that's tough to do. I commend her for that." Of all the players sent to new teams prior to 2018's non-waiver Trade Deadline, perhaps none faced a smoother transition than Kevin. The new Brave had to merely swap Manhattan hotel rooms after he was dealt by the Orioles, who were playing at Yankee Stadium at the time. Then he switched direction. A short drive to Queens planted Gausman at the door of his new clubhouse—one full of familiar faces. "We've joked about this being Baltimore South," Gausman said. Said in jest, but not without merit. Even without Brad Brach and Darren O'Day, who were both traded to Atlanta alongside Gausman for a bundle of prospects, Gausman's new home comes packed with reminders of his old one. There is Nick Markakis, his former locker neighbor in Baltimore. There is Ryan Flaherty, who played behind Gausman for five seasons. And then there are director of pitching Dom Chiti and special assistant to pitching Dave Wallace—two reasons the Braves had targeted Gausman for some time. Both worked with Gausman as a younger pitcher. "I think that had a lot to do with them going after me," Gausman said. "Their saying, 'We can get him back to where he was before.'" For the Braves, the hope is these comforts help Gausman blossom like he never truly did in the Charm City. The No. 4 overall Draft pick in 2012, Gausman was in the big leagues less than a year later. But inconsistencies followed. Gausman went 35-49 with a 4.24 ERA in 127 starts over parts of six seasons in the hitter-happy American League East. "I had some good years with the Orioles, but to be honest, I never felt like I got to the best of my abilities," Gausman said. "Not that I've had a bad career, but it's tough to pitch in the AL East." Kevin will slide into the back of Atlanta's modified six-man rotation going forward, with Gausman's first start set against the Mets. "I have to think someone coming from the AL East is going to like where he ends up," Braves manager Brian Snitker said. "We've liked his stuff for a long time. We think in our system, we can do a lot to help him. Maximize what he's got." April 8. 2019: Kevin Gausman has been in the Majors for seven seasons, and somehow, the right-hander has never pitched at Coors Field, located in the hitter-friendly climate of his hometown of Denver. That will change, with Gausman slated to start the three-game series finale between the Braves and Rockies. "It's crazy, because I feel like I've been in the big leagues for a good bit," Gausman said. "And I haven't been here. This is one of two ballparks -- here and Busch Stadium -- that I haven't played at. So that's kind of weird, being that I grew up 30 minutes from here." The Orioles selected Gausman with the No. 4 overall pick in the 2012 Draft out of Louisiana State University, but he grew up on the Little League diamonds of Aurora, Colo., a suburb about 30 minutes southeast of Denver, and he later played at Aurora's Grandview High School. Gausman hasn't yet taken the mound at Coors Field as a Major Leaguer -- he played in a high school exhibition game at the ballpark -- but he's very familiar with it, growing up a Rockies fan and visiting frequently to see his favorite club in action. "I remember watching Andres Galarraga and Dante Bichette, the Blake Street Bombers," Gausman said. "Those teams were really fun to watch. And later, I got to play with Ubaldo Jimenez for four years [in Baltimore]. I used to watch him all the time in high school, so that was pretty cool." Coming off seven scoreless innings in the Braves' win over the Marlins this past Friday, Gausman got to sleep in his own childhood bed on Sunday night after the club landed in Denver. And he's thrilled that much of his family gets to meet his two-month-old daughter for the first time. Gausman has purchased multiple Coors Field suites for each game in the three-game series, and he expects about 100 of his family and friends to be in attendance for the long-awaited homecoming. As for the task ahead of him, Gausman knows a slow start to the Rockies' season doesn't change the fact that Colorado's lineup includes top hitters like Nolan Arenado, Trevor Story and Charlie Blackmon. "You make good pitches, you're going to get guys out," Gausman said. "I don't think you can try to be too perfect out there. I think when you start trying to be too fine, that's when you get in trouble." While Gausman knows the challenge from the batter's box will be formidable, especially at Coors Field, the right-hander said he doesn't plan to change anything about his routine or approach when he takes the mound, one that he's seen others throw from countless times, perhaps in his mind's eye imagining himself up there someday. "Absolutely," Gausman said. "My parents have this kids' coloring book, and it has an insert -- you insert a picture -- and the cutout is like a Rockies player that signs a one-day contact, comes up in the ninth inning, hits a walk-off and the fans are carrying him off the field. Of course, my baby picture is slid in there." June 2012: The Orioles made Gausman their #1 pick in the draft, out of LSU. Kevin was the fourth overall pick, behind only SS Carlos Correa (Astros), OF Byron Buxton (Twins), and C Mike Zunino (Mariners). Kevin's pitching coach at LSU was former Orioles' bullpen coach Alan Dunn. Gausman signed, via scout Dave Jennings, just an hour or so before the signing deadline on July 13. He received a bonus of $4.3 million. Feb 7, 2017: Gausman and the Orioles avoided arbitration, agreeing to a one-year deal worth $3.4 million. July 31, 2018: The Orioles traded Gausman and RHP Darren O'Day to the Braves for RHP Evan Phillips, 3B Jean Carlos Encarnacion, C Brett Cumberland, LHP Bruce Zimmermann and future considerations. Jan 11, 2019: Kevin and the Braves avoided arbitration, agreeing to a one-year deal worth $9.35 million. Gausman is a tall, lanky righthander with a plus-plus 92-97 mph four-seam FASTBALL with good armside run. He also has an 82-84 mph hard-diving SLIDER that has cutter action, getting some swings-and-misses, and an 86-89 mph Vulcan-CHANGEUP and he has an 84-87 mph SPLITTER. "My changeup was probably the main reason I got drafted by the Orioles. My fastball is kind of a sinking fastball and at Camden Yards, the ball can fly out of here sometimes. But the biggest focus for me will be my two breaking pitches, my slider and curveball," Kevin said in 2014. 2016 Season Pitch Usage: 4-seam Fastball: 63.1% of the time; Sinker 2.6% of the time; Change 1.8%; Slider 1%; Curve 13.3% of the time; and Split 19.2% of the time. 2018 Season Pitch Usage: 4-seam Fastball 58% of the time, his Sinker less than 1%; Change less than 1%; Slider 14.2%; and Split 27.1% of the time. Average velocity: 4-seam 94.2 mph, Sinker 92.6, Change 86.1, Slider 82, and Split 83.2 mph. He is a solid competitor. And he knows how to pitch. He is confident and unflappable. Gausman is tall and wiry. He is a premium athlete with a live body, he has a smooth, high-leg kick delivery that helps him stay over the rubber. His aptitude and intelligence help set him apart. Kevin's tendency to tilt his shoulder in his delivery affects his ability to work the corners and pitch down in the zone. But he throws strikes with his powerful right arm. Gausman tends to recoil and throw slightly across his body. he has a soft stap on the back side. One scout's comments: Gausman is the consummate competitor, with enough nasty in him to stare down the game’s top bats without fear. He has the pure arsenal to succeed right away in Baltimore and could quickly settle in as the rotation headliner for the foreseeable future. "Kevin is like a GPS," Orioles director of pitching development Rick Peterson said in May 2013. "He's constantly recalculating. He has great mound presence and great awareness. To me, that's what makes him incredibly special. "He's incredibly self-disciplined and incredibly self-motivated. He has a burning desire to be the best." August 2013: Gausman was rated by Baseball America's annual poll to have the best changeup and best control in the Double-A Eastern League. In 2014, Kevin began sporting a different look on the mound. He ditched his contact lenses and is wearing thick-rimmed glasses. The “nerd” look provides a nice contrast to the upper-90s fastballs that he’s blowing past hitters. Gausman is farsighted with astigmatism, as he explained it, with his right eye worse than his left. He experimented with the glasses this spring, though he’s also going to purchase contacts in case he needs to switch. Gausman wore glasses as a young kid, but discovered that they weren’t cool in middle school. He switched to contacts in high school. As of the start of the 2019 season, Kevin has a career record of 44-54 with 4.12 ERA, having allowed 115 home runs and 851 hits in 823 innings. May 2-10, 2014: Kevin was placed on the Minor League disabled list with focal pneumonia, which was actually good news given that the original, mistaken diagnosis was a left intercostal strain. May 8-June 20, 2015: Gausman was on the D.L. with right shoulder tendinitis. He began some anti-inflammatory medicine that takes 72 hours to take effect. 2016 Spring Training: Gausman received a cortisone injection for a case of lingering tendinitis in his right shoulder. March 25-April 25, 2016: Kevin began the season on the 15-day D.L. with tendinitis in his right shoulder. March 25-April 5, 2019: Kevin was on the IL with right shoulder tendinitis.